The bachelor's program alt = "Early Education - Management and Management in Early Childhood Education is intended as a distance learning course for educators as well as for all those working in the professional field of alt =" Early Childhood Education. In 5 semesters, the Bachelor's degree program prepares students for the assumption of management and management tasks in day care centers and other institutions for early childhood education. The program is accredited by the accreditation agency AHPGS. The goal of this program is to professionalize the early childhood education professionals, thus integrating the European level of education through academization. The focus of the program is to provide the students with the knowledge and skills necessary to enable them to fulfill management and management responsibilities in early childhood and childhood education institutions. The study alt = "Frühpädagogik also includes the analysis of child development and education processes of children up to 10 years. In addition, they acquire the ability of scientific work and research in the field of early and childhood education. 11 modules Studying at the DIPLOMA University. Professional practice and early childhood education. The study program is offered as distance learning with attendance phases, which take place on approx. 12 Saturdays per semester, and can therefore be very well connected with the professional activity or family obligations. The study form is designed as "blended learning" and thus forms a coordinated combination of the study elements "Editing the study books", "interactively studying in a real or virtual lecture hall" and the passing of examinations in study centers close to the home. The knowledge acquired at the vocational colleges or universities is credited with 60 ECTS; Therefore, the first two semesters for the fully trained professionals from the fields of education, pedagogy and social education (educators and other access professions on demand) and there remain de facto five study semesters. After successfully completing a bachelor's degree in distance learning alt = "Early Education - Leadership and Management in Early Childhood Education and the additional qualification as a state-recognized childhood educator, the graduates will have different professional perspectives. 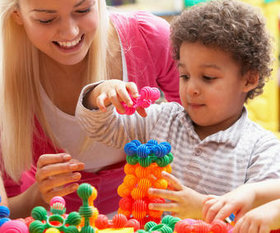 Day care centers for children, hoarding, schools or family centers, but also in counseling or early learning centers, in the continuing education sector, in inclusive and intercultural education, as consultants or at universities and research institutes. The diverse fields of application and the predicted demand for qualified specialists as well as the persistent shortage of skilled workers offer the graduates very good career advancement opportunities. After completing your first academic degree, you have several options: You can either start your further professional career, then start a Master's degree immediately, or you can take on a further education master (eg MBA) while you are working. Distance learning with real or online classroom sessions: Distance learning takes place between self-study with study programs and full-day Saturday seminars (about 12 Saturdays per semester) at one of our numerous nationwide study centers or online in the "virtual lecture hall" of the DIPLOMA Online Campus. Higher education entrance qualification or higher education entrance qualification (HZB) according to Hessian university law as well as proof of completed vocational training as a state recognized teacher or equivalent professional qualification from the areas of education, pedagogy and social pedagogy (eg curative educator / curative educator; Primary school teacher) and proof of at least 12 months of professional experience in this field. For further information on special qualifications or admission requirements without HZB , please contact DIPLOMA Hochschule on request and info@diploma.de. Bachelor of Arts (BA) and state recognition as a childhood educator / childhood educator. In addition to the Bachelor's degree and state recognition, the graduates also receive a so-called "Diploma Supplement" written in English and a "Transcript of Records", which awards them internationally as academics with a Bachelor's degree identify. With this DIPLOMA course, the already acquired practical skills are complemented and extended by (academic) theoretical background knowledge. This allows you to detect more complex relationships and better integrate a multidisciplinary network. The degree program "alt =" Early Education - Management and Management in Early Childhood Education "(BA) leads to a scientific approach to the field of work.Thus, the degree forms the basis for further specializations and is therefore the prerequisite for your unlimited career opportunities. As a holder of a BA alt = "Early Education - Management and Management in Early Childhood Education, you have all the possibilities in the field of continuing education, corporate management and organization in hoarding, schools, family centers, day-care centers and crèches as well as for academic work Further fields of activity can be found in the attached PDF "Occupational Profile Childhood Education". A successful bachelor's degree program is the basis for a master's degree program, which in turn can lead to a doctorate.